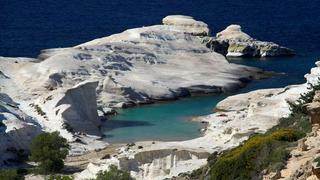 The Cyclades are probably what most people think of when anyone mentions Greek islands. A group of over 200 islands, many uninhabited, stretching south-east from mainland Greece, the Cyclades include islands such as Santorini, Mykonos, Paros, Naxos and Delos, to name just a few. Originally, the Cyclades were the peaks of a prehistoric mountain chain, now flooded by the Mediterranean, although Milos and Santorini are volcanoes. So many, and so varied, are the Cyclades that it is impossible to sum them up in the space we have here. Nor are they easy to categorise, because although they are grouped geographically they are very different in terms of topography and nature. Santorini, for instance, is steep and volcanic, whereas Naxos is relatively flat and fertile. They do, however, have great beaches, charming sea-front tavernas, and the sense that very little has changed here in several hundred years. Some of the Cyclades that are definitely worth a visit include the aforementioned Santorini for its spectacular landscape and the frescoes at Akrotiri, the party island of Mykonos, Delos for its incredible archaeological remains, Milos for its incredible rock formations, and the rest of them for their beautiful sandy beaches and picture-postcard whitewashed villages. Any cruise around the Cyclades is likely to start from Athens, and this is a town that really deserves a few days of your time. Obviously the Parthenon is on everybody’s must-see list, but the adjacent Erechtheion on the north side of the Acropolis is infinitely more beautiful. A visit to Athens would not be complete without a trip to the Archaeological Museum, the Agora, and the Temple of Poseidon out at Cape Sounion.